Utility Ring : Schaefer Marine, Inc. Perfect for adjustable backstay configurations and many other applications. 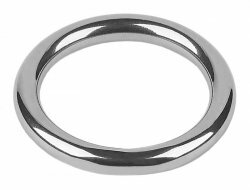 Schaefer's high strength stainless steel rings are welded from Stainless steel rod then polished and buffed to a mirror smooth finish.